Hills Prescription Diet Canine t/d, available at VioVet, has been specially formulated as an ideal feed for dogs with dental disease and related complaints. Not only is this a painful problem but it can lead to further health issues in the future. 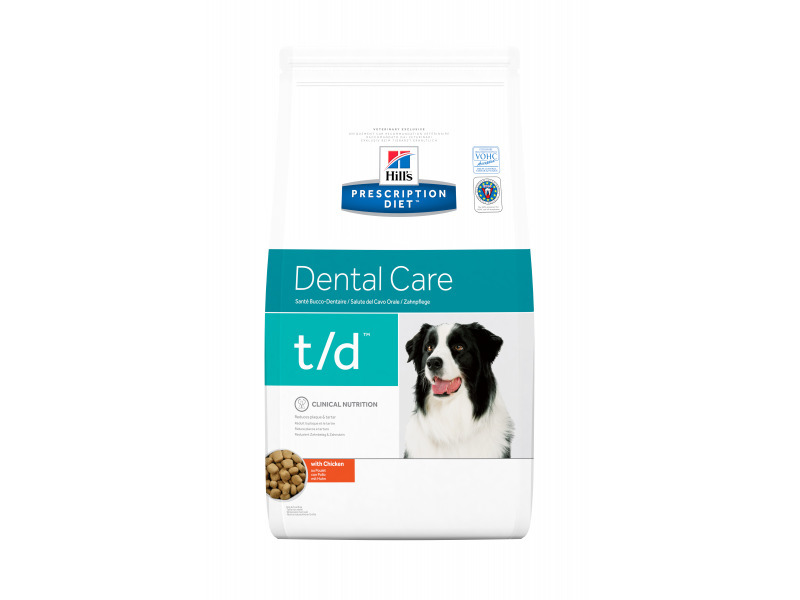 Hills Prescription Diet t/d has been developed for the nutritional management of dogs with dental disease due to a build-up of tartar and plaque beneath the gum-line. Non-random Fibre matrix resists crumbling. Kibble engulfs tooth before it splits and fibres wipe the tooth surface. t/d Mini: Moderately large Provides an appropriate size for different breeds. Kibble engulfs tooth before it splits and fibres wipe the tooth surface. Protein Moderately reduced Helps limit a component of plaque. Calcium Moderately reduced Helps limit plaque mineralisation to tartar. Ingredients (Mini): Chicken: Maize, brewers' rice, chicken (24%) and turkey meal, cellulose, animal fat, pea bran meal, digest, dried whole egg, minerals, soybean oil, vitamins, taurine, trace elements and beta-carotene. With a natural antioxidant (mixed tocopherols). Ingredients (Normal): Chicken: Maize, brewers' rice, chicken (24%) and turkey meal, cellulose, animal fat, pea bran meal, digest, dried whole egg,minerals, soybean oil, vitamins, taurine, trace elements and beta-carotene. With a natural antioxidant (mixed tocopherols). Clinically proven to reduce gingivitis and the build-up of tartar, plaque and stain. fed dry (adding water prevents effective cleaning). Other dental home care methods can be used as well, e.g. regular tooth brushing. Some dogs prefer to eat each piece of t/d™ Canine away from their food bowl; owners should be reassured that this is normal behaviour. Dental plaque, stain and tartar (calculus). 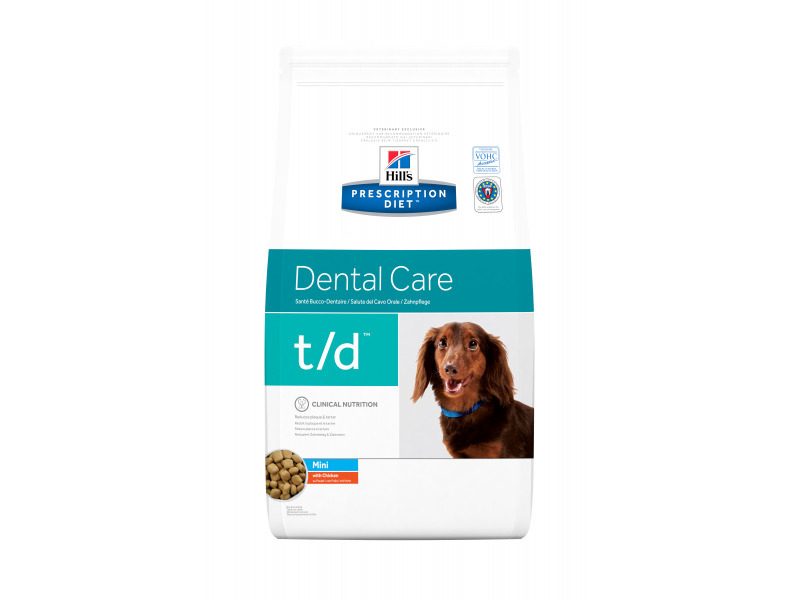 Below are some recent questions we've received regarding Hill's Prescription Diet t/d Dental Care Chicken Flavor Dry Dog Food, including answers from our team. Hill's T/D - can it be used as a treat? Our two flyball border collies aged 7 and 5 are both fed Hills J/D and are doing well on it. The older one, Meg, has just had her teeth cleaned at the vets and we would like to use Hills J/T to help keep them clean. Two questions - is the composition of the food very different? Can Meg remain on J/D with J/T being used more as a treat each day? Your opinion would be much appreciated. Many thanks. I presume you mean Hills t/d as an alternative to Hills j/d. The physical structure of the kibble (biscuit) is very different and the t/d mechanically helps to keep the teeth clean. The more t/d that is eaten, the better it is for the teeth. Personally I would suggest gradually changing from j/d to just t/d for both dogs, but then adding a joint supplement to the diet, such as Yumove or Joint Force. This should provide the best of both worlds.